I read Adam Nevill's The Ritual last year, and it made me eagerly look forward to the film adaptation (which was one of my most-anticipated films of 2018), which just hit Netflix Friday, February 9th. The book's first half was terrifying, and I couldn't wait to see such nightmarish visions come to life on the screen as imagined by director David Bruckner (who gave us strong segments in V/H/S and The Signal). Synopsis: Reuniting after the tragic death of their friend, four college pals set out to hike through the Scandinavian wilderness. A wrong turn leads them into the mysterious forests of Norse legend, where an ancient evil exists and stalks them at every turn. The first thing that struck me was how beautifully the film was shot, with gorgeous shots of mountains and forests. It created an imposing atmosphere before any real creepiness started, even in the wide open spaces of Sweden. The creepiness ramps up when the characters enter a claustrophobic, dark forest, with something sinister lurking between the stark branches. I love how the first half kept things a bit mysterious, with the dread building quickly as the characters start to freak out and realize they are being stalked. There are some really effective, really unsettling scenes throughout, and I appreciate how close to the book they kept the first half of the film. The second part of the film sees some minor changes from the book, but it kept pretty true to the spirit and structure of the original story. It wisely slimmed down the last half of the book, and I thought the film worked slightly better than the novel, even with the changes it made. I also loved the backstory of the "ancient evil" that is unveiled and thought its design was badass and terrifying all at once. The less you know going into the film the better, just let yourself be swept away by the unsettling atmosphere and nightmarish premise. 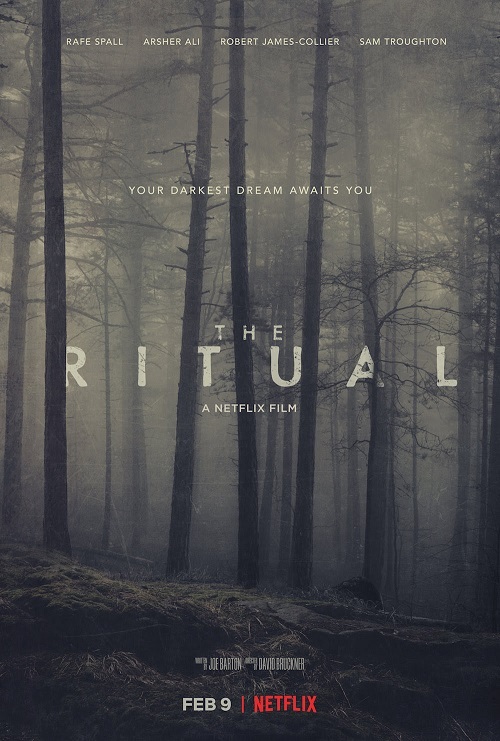 I highly recommend checking out The Ritual, streaming now on Netflix!